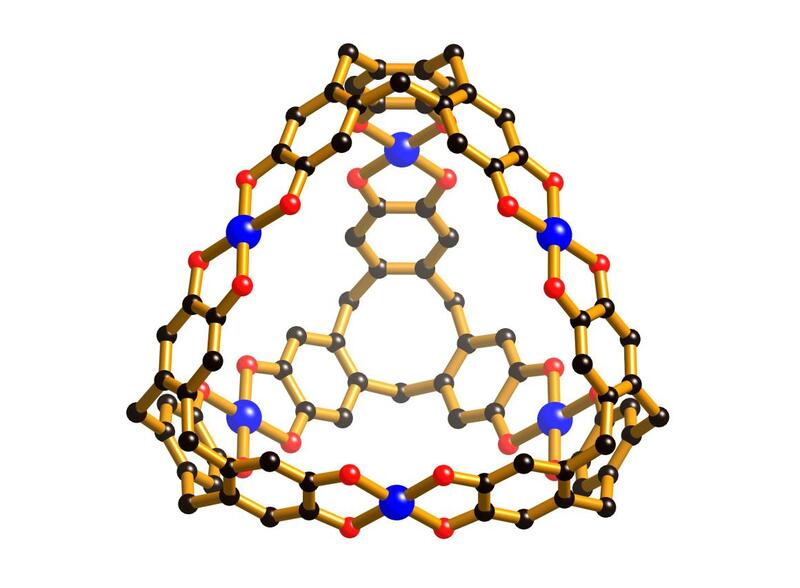 The open wine-rack structure of MIL-53(Cr), with chromium atoms in blue, and benzenedicarboxylate linkers in brown and red (hydrogen atoms not shown). 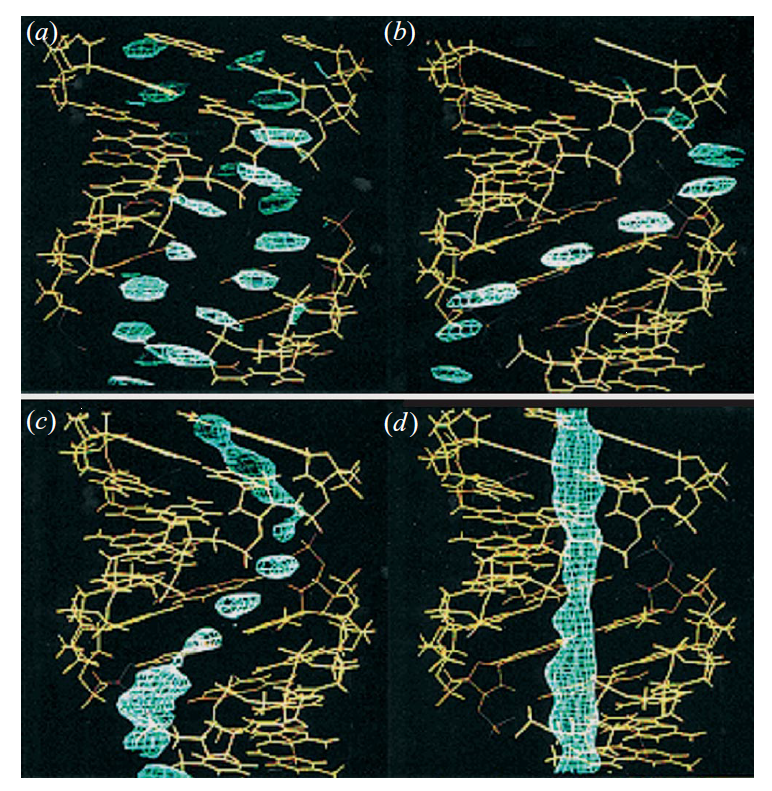 The crystal structure data can be found in the original paper describing the structure. Image generated using the VESTA (Visualisation for Electronic and STructual Analysis) software. What is it? Where did the structure come from? 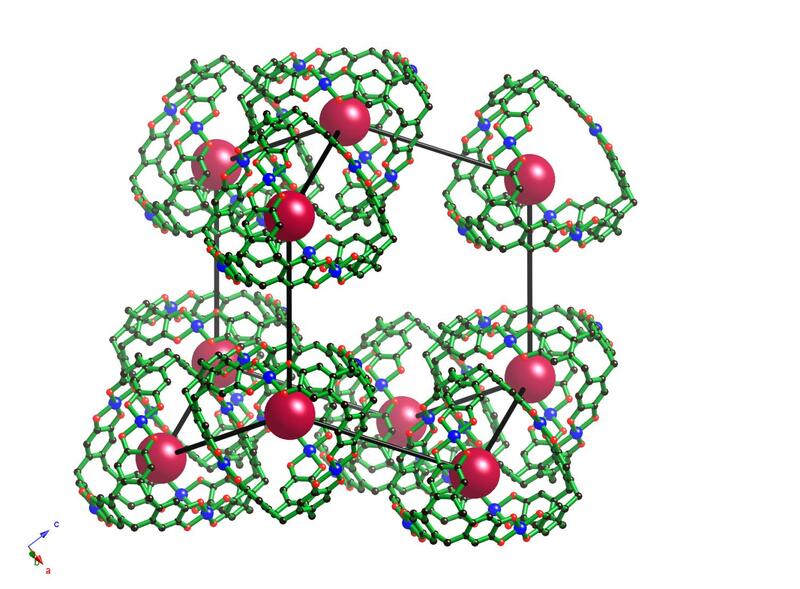 MIL-53(Cr) is a metal-organic framework made up of chromium atoms linked together by benzenedicarboxylate molecules, forming a three dimensional wine-rack-like structure. MIL stands for Materials Institut Lavoisier, after the place where the material was first made by C. Serre et al. in 2002. MIL-53 exhibits a ‘breathing’ effect, where the structure opens and closes depending upon what’s inside the pores. When hydrated, rather than causing swelling of the framework, the water molecules inside have an attractive effect on the walls and actually hold the wine rack closed. Once the water is removed by heating, the flexible wine rack opens and the volume of the structure expands by an impressive 50%. Similar breathing phenomena have since been found in other frameworks, and can be used for selectively separating different gases, when the structure only opens up for a certain type of molecule. The structure of Meridianiite at 250 K. This image was created using the diamond visualisation software. Mg is pinky-red, S is yellow, O is white and hydrogen (technically deuterium), is grey. MS11 is only stable below 2°C. This means that on Earth we mainly find it at the cool extremes of our planet; tundra and cold deserts are MS11’s favourite places to be. On Mars the temperature variations on the planet mean that the conditions that MS11 forms in and is stable at are much more prevalent and the “Mg-sulphates” which have been identified by various instruments on Mars may well be Meridianiite. As we heard with Bridgmanite, a mineral can only be named once it has been found in nature. This mineral was first synthesised by Fritzsche in 1837, just like Glauber and Mirabilite, this salt was called Fritzsche’s salt to begin with. Fritzsche thought that MS11 was actually MS12 – Magnesium sulphate with 12 water molecules attached rather than 11. He worked out the composition by measuring the mass lost as the compound dehydrated and must have counted 12 waters instead of 11. This was put right in 2006 by Petersen and Wang who solved the structure and realised there were only 11 waters rather than 12. Shortly after this, a natural sample of Meridianiite was found in Canada and so it was officially named and became a fully paid up mineral. 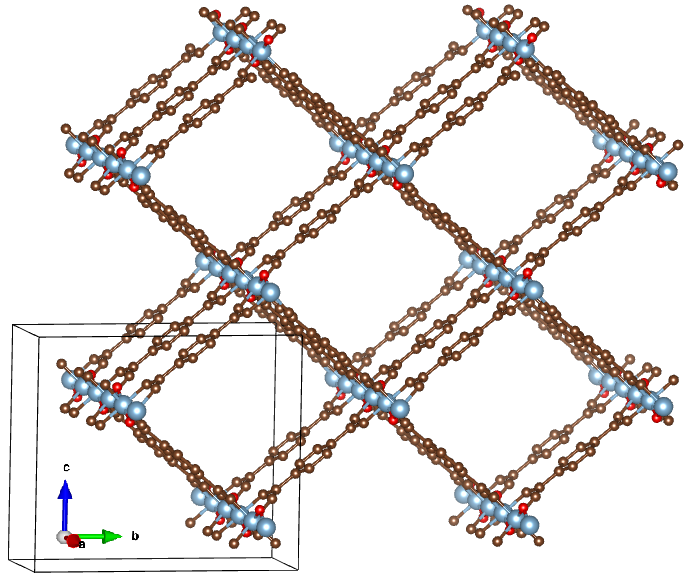 This structure is actually for deuterated Meridianiite, (the hydrogen atoms are replaced by deuterium) and comes from a study using time-of-flight neutron diffraction to investigate how the structure of MS11 changes as temperature varies from 10 – 300 K.
Fortes A. D., Wood I. G. and Knight K. S. (2008) The crystal structure and thermal expansion tensor of MgSO4-11D2O (meridianiite) determined by neutron powder diffraction. Physics and Chemistry of Minerals 35 207-221 and is available on the American Mineralogist Crystal Structure Database. Figure 1. A ball and stick representation of a single [Cu6(ctc)4]12- tetrahedron. Hydrogen atoms have been omitted for clarity. Colour code: Oxygen red; Carbon back; Copper blue. For millennia philosophers and mathematicians have pondered the mysteries of the simplest platonic solid, the tetrahedron. Aristotle believed, in error, that regular tetrahedra could pack together to completely fill space, a hypothesis that endured for close to 1800 years.1 The problem of determining their maximum packing efficiency is still being investigated today.2 Perhaps a more fascinating subject for us as chemists and crystallographers however, is the arrangement of molecular tetrahedra in crystals. Figure 2. 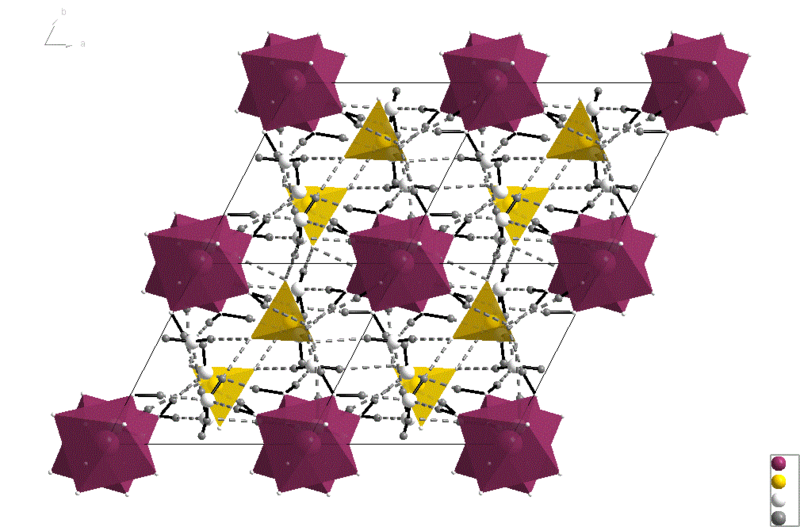 The arrangement of [Cu6(ctc)4]12- tetrahedra of the crystal structure of (NMePent3)6Na8[Cu6(ctc)4]I2.solvate. Maroon spheres represent the centroids of the tetrahedra which are arranged in adamantine (diamond) type units. Hydrogen atoms, disordered solvent and counter ions have been omitted for clarity. Colour code: O red; C back; Cu blue. The synthesis and structural characterization of (NMePent3)6Na8[Cu6(ctc)4]I2.solvate were carried out in the Abrahams/Robson research labs, School of Chemistry, The University of Melbourne. The work is published in Chemical Communications. DOI: 10.1039/c1cc12723c. (1) Chen, E. R. No Title, University of Michigan, 2010. (2) Chen, E. R.; Engel, M.; Glotzer, S. C. Discrete Comput. Geom. 2010, 44, 253. (3) Abrahams, B. F.; FitzGerald, N. J.; Robson, R. Angew. Chem. Int. Ed. Engl. 2010, 49, 2896. (4) Abrahams, B. F.; Boughton, B. A.; FitzGerald, N. J.; Holmes, J. L.; Robson, R. Chem. Commun. (Camb). 2011, 47, 7404. Protective antigen from Bacillus anthracis. Anthrax is the disease that is caused by the soil bacteria Bacillus anthracis. Anthrax commonly infects wild and domestic animals such as cattle, which ingest bacterial spores whilst grazing, but anthrax can also (rarely) infect humans. B. anthracis ability to form spores to survive extreme environments is what makes it suited to turn it into a biological weapon. This is where anthrax gets its notoriety from. One example includes the 2001 Anthrax attacks where B. anthracis spores were posted in letters to various US news outlets and US Senators. When the spores get inside the body they are activated. The bacteria start to grow and multiple and produce the anthrax toxin. There are three proteins that make up the anthrax toxin: protective antigen, edema factor and lethal factor. Today we are showing you the structure of protective antigen (so named because it is the antigen that is used in the current anthrax vaccine). 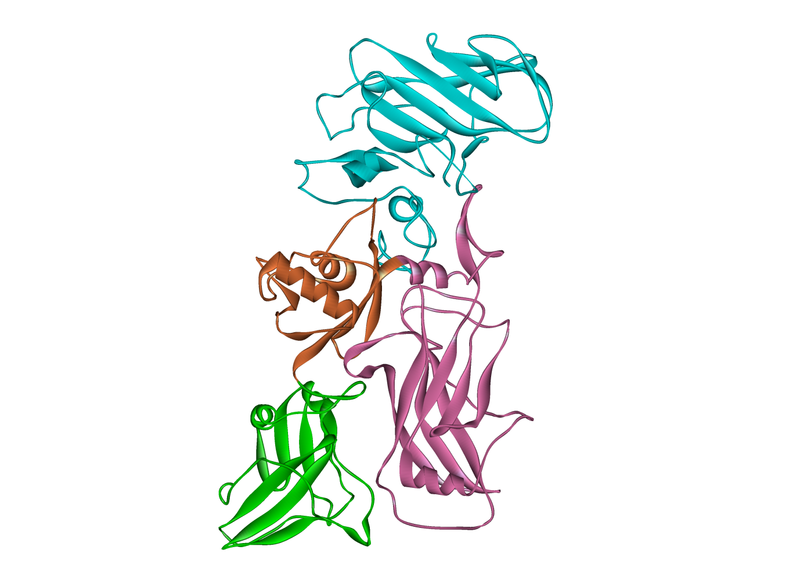 Protective antigen is an 83 kDa protein that has four domains. Domain I (cyan) has a jelly roll topology, domain II (pink) has a Greek key topology, domain III (orange) has a similar topology to ferredoxin, and domain IV (green) has an immunoglobulin-like topology. When protective antigen binds to receptors on the cell surface of the infected host the protective antigen is cleaved in domain I by a protein called furin creating two fragments: PA63 and PA20. PA20 plays no further role in the anthrax story but PA63 will form a heptamer (a group of seven PA63 molecules, see below) which edema factor and lethal factor bind to. The PA63 heptamer with edema and lethal factors bound is internalised into the cell in an endosome. The low pH inside the endosome causes the PA63 heptamer to change in conformation and form a pore releasing edema factor and lethal factor into the cell. Edema factor disrupts water homeostasis causing a build-up of fluids in the body known as edema, and lethal factor disrupts cell signalling process which leads to cell death. In 1881 Louis Pasteur demonstrated the use of the first vaccine against anthrax (and this was the second vaccine to be made after Edward Jenner’s smallpox vaccine in 1796). Pasteur’s vaccine was a weakened strain of B. anthracis by exposing the bacteria to oxygen (although there is some controversy surrounding this). Modern anthrax vaccines are a bit more sophisticated and protective antigen forms part of the active ingredient. The B. anthracis PA63 heptameric pre-pore. 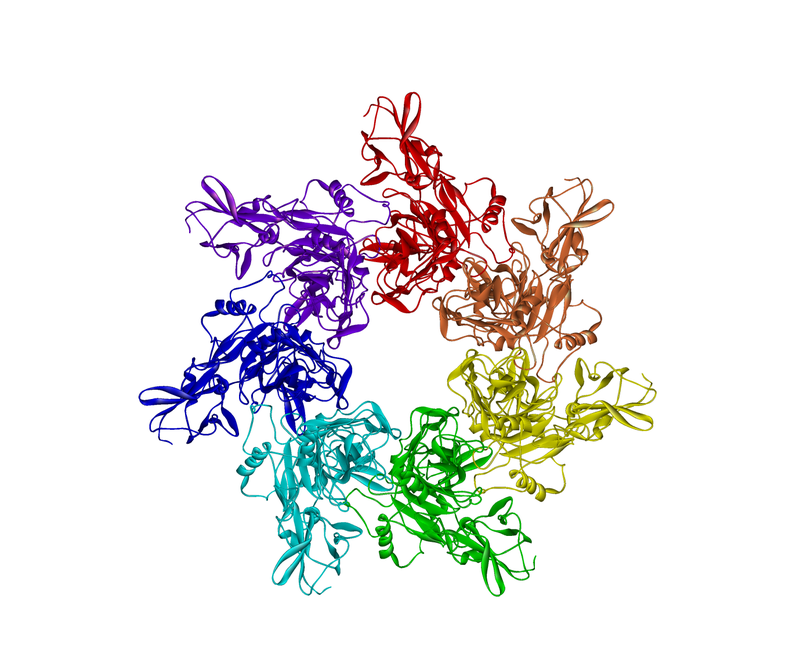 The crystal structure of protective antigen was first solved by Carlo Petosa and colleagues in 1997  (PDB number 1ACC) and the crystal structure of the PA63 heptamer pre-pore was solved by Borden Lacy and colleagues in 2004  (PDB number 1ZTO). C. Petosa, R.J. Collier, K.R. Klimpel, S.H. Leppla and R.C. Liddington (1997) Crystal structure of the anthrax toxin protective antigen. Nature 385: 833-838. D.B. Lacy, D.J. Wigelsworth, R.A. Melnyk, S.C. Harrison and R.J. Collier (2004) Structure of heptameric protective antigen bound to an anthrax toxin receptor: a role for receptor in pH-dependent pore formation. Proceedings of the National Academy of Sciences USA 101: 13147-13151. Eugenol is a small molecule that is often found in essential oils, such as oil of cloves, nutmeg and cinnamon. On it’s own it give a pungent smell, and it’s antiseptic properties are used when combined with zinc oxide to make a paste often used in dentistry. Unlike quinine, Eugenol is very insoluble in water which limits it use, both in perfumery and dentistry. It is also quite unstable in light and heat, so researchers have been investigating to enhance its stability without changing its potential medical properties. 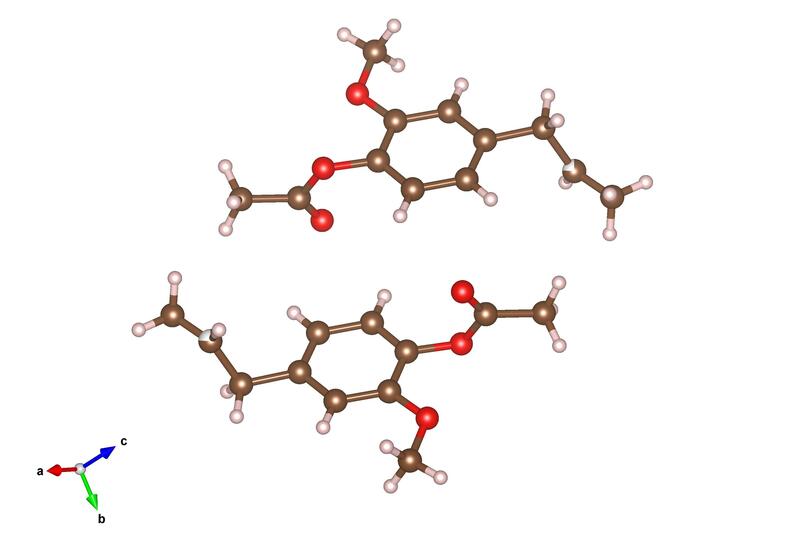 One potential solution has been to add an acetate to the molecule, making eugenyl acetate. 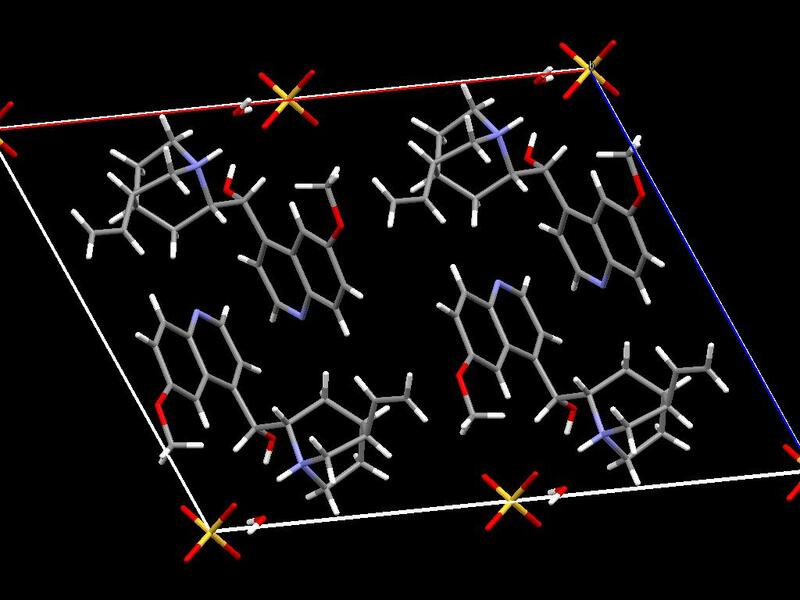 This crystal structure was determined by dos Santos et al. in 2009. The crystal structure is #702999 in the CSD. As it’s National Tree day this Sunday (27th July), our two post this weekend are on very useful materials that we’ve got from tree! First up is quinine. Quinine is a molecule that was first discovered by the Quechua people of Peru, who distilled it from the bark of the cinchona tree and used it as a muscle relaxant. But it has als been used since the days of the Romans as an antimalarial. Quinine can readily dissolve into water (creating tonic water) but was always very bitter. Later, people were to add gin to tonic water – making it a lot more pleasant to drink – and a mixture that is still very much enjoy to this day. One of the interesting properties of quinine is that it fluoresces under UV light, hence can be used to make glow-in the dark jellys! The original double helical model so widely known today was published by Watson and Crick in 1953. Like most scientific breakthroughs, their discovery was based on nearly a century of incremental advances in DNA research. 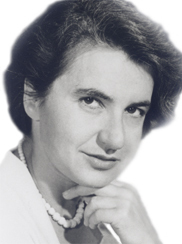 Importantly, Rosalind Franklin’s beautiful X-ray diffraction images, collected while she was working at King’s College, London, were evidence of the helical structure. On the left, the famous ‘photo 51’, a diffraction image of DNA fibres produced under Rosalind Franklin’s supervision, which was shown to Watson and Crick before they published the structure. On the right, Rosalind Franklin. Rosalind Franklin also realised the importance of water in the structure of DNA, and showed that different forms of DNA were produced depending on water content… which brings me to an unavoidable plug for neutron scattering. The neutron fibre diffraction work on DNA is a beautiful example of how neutrons can be used to localise water molecules in a structure, as shown below. Fuller W, Forsyth T, Mahendrasingam A, Phil Trans R Soc Lond B (2004) 359 1237-1248.